After you spend time creating and customizing an Access web app, you can save your web app as a package and reuse it on other SharePoint or Office 365 sites. The simplest way to do this as a site owner is to upload your web app package file straight to your site. On the site where you want to upload your custom Access web app, click Settings > Add an app. On the Site Contents page, type Access in the search box and click Search. The Access App tile will appear in the search results. Click the Access App tile. 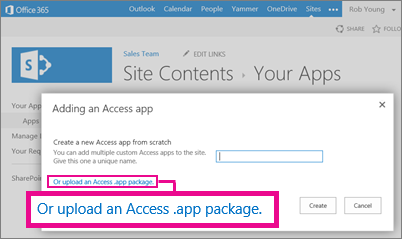 In the Adding an Access app dialog box, click the Or upload an Access .app package link. The dialog box changes and a Browse box appears. Wait a few minutes for your web app to get added to the site and then click the tile to open it. 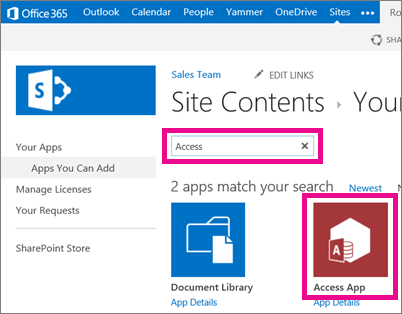 Tip: If you want to make your Access web app available on sites throughout your organization, you’ll need to upload your Access web app to your App Catalog or the SharePoint Store.